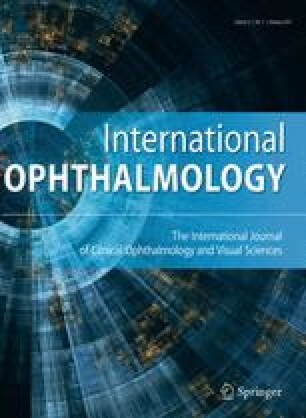 The aim of the study is to evaluate the long-term clinical results of amniotic membrane transplantation (AMT) combined with mitomycin C (MMC) for reconstruction of conjunctival defects created during the excision of ocular surface squamous neoplasia (OSSN). Eight consecutive eyes of seven patients (five males and two females; mean age, 64 ± 19 years) treated by one surgeon (KH) were included in this study. AMT was performed after excision of a mass region, along with 0.04 % MMC treatment for the exposed sclera. The tumor size, histopathological retrieval, AM graft size after tumor excision, recurrence, and postoperative complications were recorded. During a mean postoperative follow-up period of 60.9 ± 14.6 months (range 36–78 months), the ocular surfaces completely re-epithelialized in all cases. The median size of the tumor was 44.4 ± 21.2 mm2 (range 13–67 mm2). The histopathological diagnoses were five cases of squamous cell carcinoma in situ (SCC in situ) and three cases of dysplasia. The median size of the AM graft after tumor excision was 100.8 ± 32.7 mm2 (range 49–151 mm2). A case of recurrent SCC in situ with a preoperative history of using MMC eye drops developed further corneal limbal deficiency and was treated with therapeutic soft contact lenses. A case of dysplasia with a history of large pterygial excision developed symblepharon postoperatively was treated with AMT 6 months after tumor excision. The tumors recurred in two eyes with SCC in situ and were successfully treated with continuous AMT and MMC. No severe complications, such as infections, corneal or scleral thinning, or ulceration developed in all cases. The combination of AMT and MMC is effective for safe reconstruction over the long-term after the excision of OSSN with postoperative careful observation and treatment. In recurrent tumor excision cases, AMT is a suitable technique for repeated ocular surface reconstruction.